I joke sometimes that if I could only eat one food for the rest of my life, that it would be french fries. I do so love french fries but I think a lifetime of them, even the very best ones with lots of ketchup, would get old. But some kind of Asian noodles in some kind of Asian curry sauce with tofu with some kind of green vegetable? That could sustain (and not bore) me. I make a lot of dishes like this. I have never met a Southeast Asian noodle dish I haven’t liked. I love rice noodles, bean thread noodles, soba, somen, and Chinese egg noodles. I love green, red, and yellow curry. I love the combo of coconut milk, soy sauce, and curry. I love mixing shallots, garlic, and ginger into a kind of holy trinity. I love any excuse to eat tofu and to have it taste like something other than a sponge. For tonight’s dinner, I had planned to make Burmese Noodles from Deborah Madison’s Vegetarian Cooking for Everyone. As I was preparing to make the curry paste, I remembered I still had some homemade red curry paste in my refrigerator, and suddenly Burmese Noodles didn’t appeal to me. On the facing page, was a recipe for Noodles in Thai Curry Sauce which sounded good but plain. I decided to mix the two recipes and throw in some changes of my own. Almost every time I make an Asian curry, whether I am using noodles or rice, I throw in some tofu. I don’t obsess about my protein intake but when given the chance to eat tofu, in a dish where it plays so nicely with others, I take it. One of the beautiful things about this recipe is that you can change it your heart’s delight. 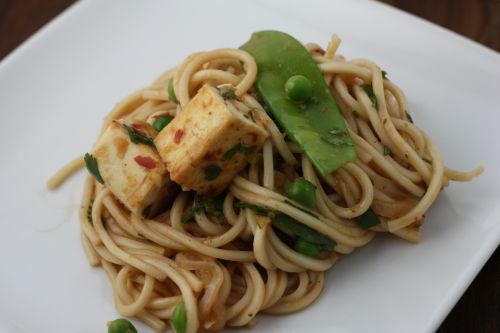 Use a different kind of noodle, use a different green vegetable, omit the tofu, substitute Thai basil for the cilantro if you are a cilantro hater. By all means, use a commercial curry paste – there are some good ones out there. Below you will find how I adapted it. Although I make dishes like this often, these noodles were one of my better creations. Here are 2 low fat notes. This kind of dish can actually be kind of unhealthy. Two ways that I try to combat that are by using low-fat coconut milk, and by not deep frying the tofu. Last night I sprayed a hot non-stick skillet with non-stick spray and fried the tofu that way. You want a bit of a crust on it. You can also get that by shallow-frying it in bit of flavorless oil (like canola). Since I was using my own curry paste (which is less spicy than store-bought), I added the full 3 tablespoons. If you are worried about spice, add just 1 to begin and more to taste if necessary. Cook noodles in pletny of boiling water until tender, about 4 minutes for the Chinese egg noodles and slightly longer for linguine. Drain and rinse well to stop the cooking and to keep them from sticking together. Set aside. Heat a non-stick skillet over medium-high heat. Spray with non-stick cooking spray and add the tofu. Cook on each side, flipping as the tofu turns slightly brown. Pour out onto a paper lined plate and set aside. Heat a wok or a skillet over medium-high heat. Pour in just enough canola oil to coat the bottom and add the shallots. Cook until starting to brown, about 4 minutes. Add the ginger and garlic and cook, stirring constantly, until very fragrant, about 2 minutes. Add the coconut milk, curry paste, and soy sauce and stir to break up the paste. Add the snow peas and green peas. Lower heat to medium-low and cook until the snow peas start to become tender, 3-4 minutes. Add the noodles and tofu and stir well. Add the scallions and cilantro and give it another good stir. Allow to cook for 2 minutes to blend flavors. Gosh, I have 2 of her cookbooks, but never made this one. I’ll look into it, because it look s good in this post. Looks delicious! I love Asian noodle dishes too. I have Deborah Madison’s cookbook but haven’t made much from it. I made a couple of things a long time ago and they didn’t turn out so well but I should give it another chance. That is some beautiful looking tofu. And yet, how could you ever limit yourself to that small a portion? Ashley, do give it another try. I have several of hers and I love them. Sometimes the recipes are more work than you want to do, but I have loved almost everything I have made from her. Mmmmm… there’s something about curry and noodles that just work so well together. One of my favourite pastas involves curry and lemongrass. 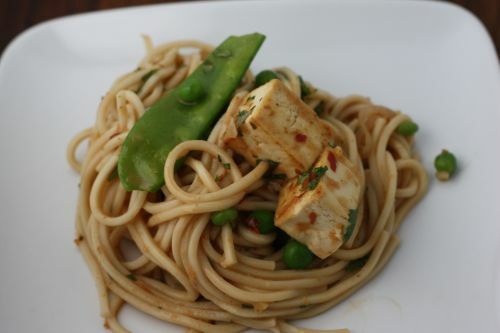 I love simple it is….I love curry and noodles and tofu together. Yum. This kind of dish is great with tofu! The sauce on yours looks delicious. Love your dish…the sauce and the tofu are just a perfect match, and the cilantro, I can almost taste it! Nice pictures. Looks so yummy! Can’t wait to try it. I love just browning the tofu the way you described. Tastes better then fried, I think. Makes my hungry to look at those beautiful pictures. Fantastic! These look delicious. I love tofu. Looks delicious. I will have to try that one. I will definitely be trying these noodles. Saw your link on Midori’s FB page and was so happy to click over to it.